InfoAdvantage offers hands-on expertise in events, design, and marketing, bringing a creative approach, can-do attitude, and amazing results. Count on expertise gained over 20 years in the digital and integrated marketing industry to deliver great results. We offer compelling marketing strategy, branding, design, websites, search engine optimization, pay-per-click advertising and online campaigns created to fit your business. You'll get amazing results when you're armed with great ideas tailored for your business, award-winning talent to elevate your brand, and a team invested in your success. When you want to strengthen relationships face-to-face with partners and customers, we can produce engaging and memorable events and conferences. We’ll plan, orchestrate and manage every aspect. Check out a gallery of the event work we've done. Want to accelerate your business development? We develop marketing strategies and deliver results. We bring creativity, design and production expertise. We plan and manage pay per click campaigns, search engine optimization, websites, emails, and marketing projects. We’re the cross-functional design and marketing team when you need solid results. you make a big splash without breaking the bank. tradeshow banners, signage and booths. websites designed for clients to tell their stories. ads or other important digital assets. We plan and manage single or multi-day business and channel conferences with hundreds of attendees, sponsors and exhibitors, and featuring a wide range of conference activities, sponsorship opportunities, special events and technical requirements. See one of our favorite conferences - the annual Directions North America conference for which we have been planner and designer since 2011. See a gallery of the event work we've done. Bellevue, Washington (Seattle-Bellevue-Redmond region) – a vibrant technology hub in the beautiful Pacific Northwest. During the past several years, we have planned and managed conferences and events held in various locations in Washington, Oregon, California, Arizona, Tennessee, Florida, and Madrid, Spain. 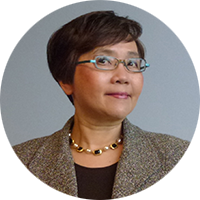 Eva Chiu, MBA, MS, founded InfoAdvantage, LLC as a web design and marketing company in 1995. Today, our core expertise includes events, design and marketing. Our clients include technology companies, professional services firms, specialty retailers, and businesses in various industries. We place an emphasis on really getting to know, and tailoring our approach and services to, our clients’ specific needs. We're hands-on and we always strive for excellence on how we approach projects so we can accomplish what have been promised to clients, and more. We have won many industry awards which attest to our excellent quality of work and adherence to best practices. We have been awarded 19 WebAwards from the Web Marketing Association (WMA), and 17 Communicator Awards from the Academy of Interactive & Visual Arts (AIVA). We look forward to providing continued successes to existing clients and helping new customers build successes. Please get in touch to discuss how we can work together.